Born March 10, 1949 in Duncan, British Columbia, Canada. 1960 moved to San Jose, California. Lived in Santa Cruz from 1972 to 1978 then moved to Seattle, where he still lives by Lake Washington (North Matthews Beach) with his loving wife, Kathleen Russell. Larry has always been very active with various creative projects. From making flower pots, macrame', photography, silk screening, metal sculpture, music recording, graphic design, to oil painting, he has always enjoyed exploring the world of art and creation of it. Here is a summary his life so far. Larry's love of surfing is an inspiration for painting "seascapes"
Now you have it ... Now you don't"
and sold over 3 million copies! 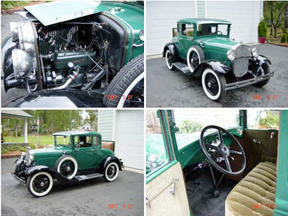 2007 - Bought a nice 1931 Model A Ford. The idea and interest in oil painting came in 1978 after finding a bunch of oil paints his wife had in college. He thought then, that some day when he was old, he'd use them. Then in the summer of 2001 Kathleen and he took a painting class and he is now using those very paints. He was much inspired by Ronald Russell and the artist, Earl Daniels, who was a master of "Seascapes / Marines" oil paintings. His wife Kathleen is just the best, words can not describe the love he has for her. She has helped him through each day by always providing him with a 24 hr available listening ear and by having natural knack for being a wonderful advice giver and has been the very best companion you could ever ask for. He has been blessed with fantastic family. His own parents (Cliff & Dorothy) as well as his wife's parents, (Ronald & Ellen Russell) have both been a major inspiration his whole life. Kathleen and Larry publish books and posters. Their publishing company is called, Walrus Productions. The name originated from each of their last names, Wall & Russell and started as a business in 1979. They keep busy shipping books and posters each day to stores nationwide. Their first book "The Road to Success is Always Under Construction" is originated from a poster they designed in 1988. They have sold about 465,000 books to over well over 2,000 different stores. In 1992 Larry designed a "Guitar Chords" poster and it has sold over 3 million copies. Currently, the main focus of Walrus Productions is providing music stores nation-wide with a product line of instructional 81/2" X 11" laminated chord charts and 23" X 25" posters. They include chord charts for the Guitar, Piano, Bass, Mandolin, Banjo and Ukulele. # 4 How Does Your Garden Grow? # 8 Does Your Computer Byte? He lived on Vancouver Island in British Columbia, Canada from 1949 to 1960 in the town of Duncan, where he was born. Larry lived in a large country house with five acres of land that fronted a lake with an island in the middle that was a bird sanctuary. There was no shortage of activities and mischief for him as a kid. Then in 1960 he moved to beautiful warm and sunny San Jose, California. What a time to grow up. 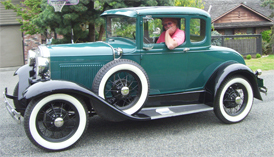 He had fantastic experiences surfing, playing lead guitar in a surf rock band called The Citations, boating, skiing, fishing, duck and pheasant hunting, hiking and cruisin' in many different cool cars. He went to many of the early concerts at the Filmore Audutorium, in San Fransico, and got to see lots of famous rock groups up close. Larry made many trips to Lake Tahoe skiing. (one day went snow skiing at Dodge Ridge in the morning and surfing in Santa Cruz that evening) Larry really has so many terrific tales of his time growing up in San Jose and later on in Santa Cruz, that if told here, he might get arrested. And ... Larry has written a autobiography, "Random Acts of Mischief"... so you can read more about it. Larry worked at numerous jobs, but finally realized he was happier working for himself. In 1961 he started with an early morning paper route (The Mercury-News) when he was only twelve years old and did that for five years. (Larry learned at a very young age the importance of knowing who and where your customer is. He worked at McDonald's (making french fries), then a real cool "India Imports" store (in the stockroom), "on the line" at General Motors (sanding cars), at a Japanese landscape company (laying sod lawns & sprinklers), at two diffent gas stations (pumping gas and doing minor tune-up and oil changes), and was proud to have worked at the Headquarters of the Rosicrucian Order, AMORC, and the Rosicrucian Egyptian Museum. This beautiful complex, established in 1927 in San Jose, California, houses several Egyptian-style buildings on a five-acre, park-like setting featuring broad lawns, palm trees, rose gardens, and exotic plants from around the world. (his job was in the building maintenance dept.) http://www.rosicrucian.org . Larry's first paintings were in an auto body shop (painting cars). He has also painted lots of houses, worked for a roofing company (hot tar roofs) and even was an ice-cream-man truck driver (although, he ate all the profits). In 1963-1966 Larry played lead guitar in a California "surf band" called The Citations. (but that wasn't really a job as it was too much fun to be called work). In 1970 he put in two semesters at San Jose City College majoring in photography and received the best grade in class. He got drafted by US Army, and to avoid going to Viet Nam, joined the Canadian Navy as a photographer. The jobs he had in the navy, (besides taking pictures of planes, buildings and people) were shining shoes, marching around the parade ground and standing at attention. He was stationed at Camp Borden, north of Toronto, Canada and after 10 months of training he was able to quit the Navy and return to Santa Cruz. In 1972 his father helped him start up a flower pot business. They were made from crushed coral (limestone) and white portland cement. Larry and his brother Raymond invented a multi-colored version that sold quite well. The flower pots were called "Coral Planters" and the pot factory had three five hour shifts of people each day turning out thousands of them. Larry produced several TV and radio commercials for the product line. The company was the very first to introduce macrame' plant hangers to the major chain stores. In 1978 larry made and sold what might have been the world's largest macrame' hanger, for the very cheap price of $175.00, to the Catalyst Club in Santa Cruz. Macrame' was popular and he designed and sold lots of different "Macrame' Kits" which provided the instructions and material (beads and jute string). By the end of the 70's the public's interest in house plants seemed to vanish and macrame' really got hurt by all the imports flooding the market. Larry first met his wife, Kathleen, in Feb, 1977 at the San Francisco Gift Show, where both of them were exhibiting their own products. Larry's booth had macrame hangers and flower pots and she had posters of Farrah Fawcett, Charlie's Angels, Wonder Woman and Starsky & Hutch. She lived in Seattle and they both commuted back and forth until they were married June 10, 1978. Kathleen helped Larry design a line of novelty "Funny Gifts" and he made the local TV news in Seattle with it. One item was called a "Genuine Dirty Gift" which was a bag filled with cigarette butts and trash. Another was called a "Genuine Corny Gift" which was of course popcorn. Another was called, "Cut your Bills in Half" which had a bag with plastic scissors in it. Larry's company name changed from "Hot Knots" to "The False Need Company" to "Easy Money" then finally in 1979 to "Walrus Productions" when he started making metal sculpture artwork and exhibited in craft shows at malls and street fairs. He designed, built and sold many unique metal art pieces. It was when Mount St. Helens exploded May 18th, 1980 that his metal sculpture adventure ended and a new one began, selling posters. His wife's company was quick to have a volcano poster printed 2 days after the blast and the company hired him to sell them. It was then he started as a poster salesman where he developed a rack inventory/ordering/system to better service the stores that allowed more contol of what each store sold. It was that innovation that allowed the poster business grow into the business it is today. Check out the poster racks in any K-mart, Toys R Us or Walmart, Larry's finger prints are still there. Selling popular posters was really fun as you might imagine. Larry distributed many different popular posters and sold millions of black light posters in Europe. He had to watch MTV so he could be up on what was hot at the time. Larry traveled to Europe twice visiting customers in Holland, France, Germany, Italy, Denmark and Sweden. Kathleen & Larry sold their interest in the company, American Arts & Graphics, to Kathleen's brother Dennis Russell in 1985. 1986 Became a Real Estate Agent and listed and sold over 40 homes in the next four years and bought a few for himself too as fixer-upper rentals. 1988 Designed the poster called, "The Road To Success is Always Under Construction". It is a collection of short, humorous quotations designed to make you think, chuckle, self-motivate and lift your spirits. The poster's message helps remind us what is necessary to be happy and succeed! http://www.walrusproductions.com/lgsuccessposter.html This poster is still a best seller. Larry typed it on a typewriter at the real estate office while doing floor time at the front desk. 1992 Designed a poster called "Guitar Chords" http://www.walrusproductions.com/guitarchords.html and wow, what a huge seller that has been. Over 3 million copies have been sold. 1992 The same year, Kathleen and Larry wrote the book "The Road To Success is Always Under Construction" http://www.walrusproductions.com/success.html after Kathleen suggested that the "Success" poster could be a good book. Since then they have published eleven books and continue to look for ideas for new books and posters. 1996 Started a web site http://www.walrusproductions.com and started learning web site design. 1999 Larry helped Kathleen create her line of "Butterfly Artwork" and exposed her artistic talent. It too is a collection of short, humorous quotations designed to make you think, chuckle, self-motivate and lift your spirits. The poster's message helps remind us what is necessary to be happy and succeed! Got a new car (1985 Ford station wagon). Kathleen and he built a chicken coop and got 3 chickens. Went on the trip to Saskatchewan with his Dad and nephew Dan for a family reunion. Made a DVD Movie for The Prospect Hotel as well as other DVD's for friends. Had the best Seattle summer weather in history and celebrated his 25th year wedding anniversary in Victoria. 2004 September he came out with Mini Chord Charts. 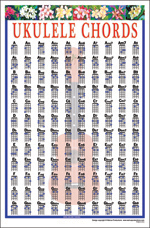 8 1/2" X 11" Laminated versions of the popular chords posters. 2005 New Product: "Mandolin Chords" chart. The Guitar and Piano Chords showed up on the Gilmore Girls TV show in two different episodes. 2006 On January 4th had to call 911 for an irregular heart beat. Got the electric paddles in the emergancy room. Left the next morning and went to Zihuantanejo, Mexico and Costa Rica for 2 weeks. Warner Bros. called to get permission to use our Road To Success poster in the new TV show called "The Evidence". Also TV show Wife Swap called to use Guitar poster. Went to Hawaii in March. SOLD ANOTHER PAINTING. Added 3 more new products (lamimated chord charts) BASS, BANJO and UKULELE. Also released a new version of the poster, "Don't Tell Me What Kind of a Day To Have. 2007 Sold 15 more oil paintings. 2011 Went on nice vacation to Hawaii - New Zealand - Australia and the Cook Islands. Took a "Road Trip. (Bucket List Tour) Drove from Los Angeles to Berkeley to visit old friends. November. Had my first public showing in the University Artwalk. Sold eight paintings. 2013 Sold a total of 65 paintings. 2014 God only knows what happen this year!!! 2015 Painted of few new ones. 2016 Sold a few old ones and a few new ones. Went to Kona on the "Big Island" with the office staff. really is ... "Always Under Construction" and that one has to be prepared to learn something new each day. IF YOU HAVE READ THIS FAR, THEN YOU QUALIFY TO SEE THE SPECIAL VERY LOW PRICE WEB PAGE. CHECK IT OUT!!! IF YOU LIKE ANY, THEN YOU ARE IN LUCK. YOU NEVER KNOW ... THERE JUST MIGHT BE A MASTERPIECE HERE. THIS IS THE ONLY LINK TO SEE THEM.